Find cholesterol test products and services with expert interviews, informational guide and more. 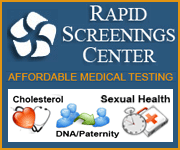 Description: Health Testing Centers offer blood, STD, and other medical tests directly to you, no physician's referral necessary: confidentially, conveniently, and affordably (up to 70% off standard laboratory prices). Description: Cholesterol test — Overview covers how to interpret the results of this common blood test. Cholesterol tests measure the level of good cholesterol (HDL), bad cholesterol (LDL), triglycerides or total cholesterol in the blood. Cholesterol testing is important, as high levels of cholesterol can put one at risk for heart disease, heart attack and stroke. A patient can work with their doctor to rectify high cholesterol levels once testing is complete. To learn more about how cholesterol tests work, please read The Guide to Cholesterol Tests or read our interview with cholesterol test expert Donald Rehm.